Day 12 of the 12 Days of Christmas series! I told ya I saved the best for the last…………My super star ornaments, Polymer Clay State Ornaments representing the two great states where we have put down roots! What they say is true, you can take’m outta Jersey but can’t take the Jersey out of them! My kids have lived in VA for more years than they have lived in NJ but they still call Jersey home. To them they will always be from Jersey! So naturally when I made an ornament for our dear VA I couldn’t leave our beloved Jersey out. Here they are stealing all the limelight on our tree. Roll the clay per the instructions on the packet to about an eight of an inch thickness. I use a sheet of plastic wrap over the clay when I roll so that it doesn’t get into contact with my rolling pin. Print out the state map outline in a 3 x 5 size. Place over the rolled out clay and trace with the X-acto knife. Remove the paper and inspect the clay. If the cut lines are not clear you could just go over the cut line one more time. With the X-acto knife cut away the excess clay in sections. You’ll end up with a clean shape. Take a straw and press down firmly into the clay where you want the hanging hole to be. With the X-acto knife gently pull up the cut out circle to leave a hole in the ornament. Bake according to your packet instructions. I over baked them especially the Jersey one. But no worries we are going to paint over these any way. The Gold one is pretty simple. Only thing was it took about 4 coats to get the right color and sheen. For the water color, I diluted the Fuchsia paint with water and white paint to get the varying ombre shades. Once I painted the color bars I gently mixed the paint into each other to create a watercolor effect. When completely dry you are ready to paint the hearts indicating where you live with the Red paint. You could seal the ornament with an acrylic sealer to protect. I didn’t as I was in a hurry. Not too hard, right? You know, when I was trying to think of paint colors to use all I could think for Jersey was Gold! 🙂 Nothing seemed more right for Jersey than Gold! Which state are you from? Do you have state ornaments on your tree? Here’s a list of my other handmade ornaments from the series: Santa Belt Ornament,Sunburst Mirror Ornament, Glitter Swirl Ornament, Terrarium Ornament, Cork Ball Ornament, Woodland Reindeer Ornament, Marbles Ornament, Vintage Jello Mold Ornaments, Snow Globe Ornament, Fabric Scraps Ornament, and Globe Ornament. 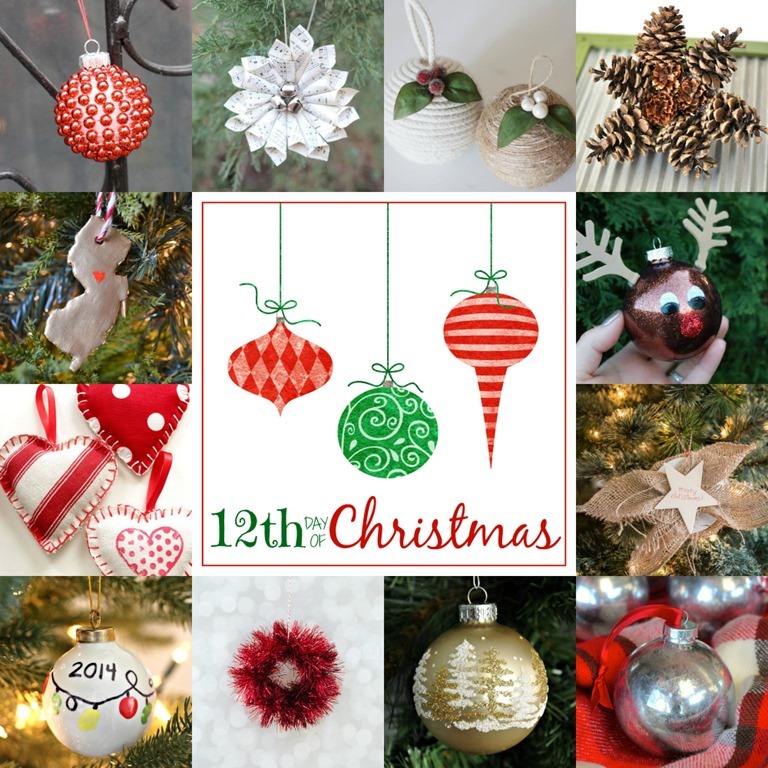 My fellow blogging buddies also have a lot more ornament inspiration to share with you all! Do stop over and checkout these cool ornaments. We would like to see some of your handmade ornaments too. So please do link up your projects all the way at the bottom of the post. Your posts will be up on all the 12 blogs and we’ll be doing features! Love love loved them all Vidya!!! Can’t wait to make some this year with the girls! I was born and raised in New York, my boyfriend in Pennsylvania, and now we have made a life together in Virginia. I think I’m going to make these for all three states and instead of ornaments (we don’t celebrate Christmas) put them out on display or maybe hang them from the wall. Can’t wait! That sounds like a great idea. Would love to see yours!